Patrick Reed won the 2018 Masters Tournament. He reportedly listens to the song "Radioactive" by Imagine Dragons to get pumped up before a game. Research suggests listening to certain types of music boosts putting performance, but the same isn't necessarily true for office-type work. 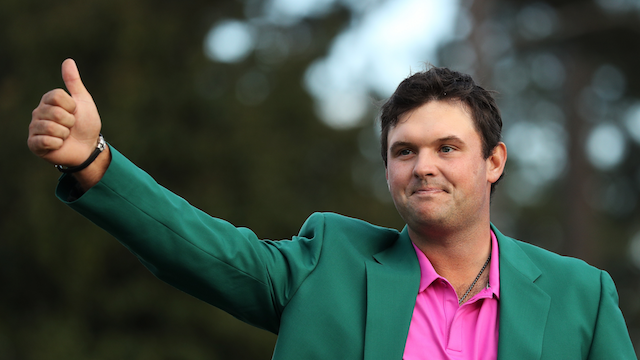 During Sunday's Masters Tournament, CBS Sports announcer Nick Faldo revealed that Patrick Reed — the 27-year-old who would soon become the Tournament champion — has a specific ritual to get pumped up before a game. It turns out that Reed is — sort of — onto something. A small 2014 study, published in the US Journal of Athletic Enhancement, found that listening to music can indeed improve putting performance. The catch is that participants in the study listened to music while putting, which is explicitly verboten in US golf tournaments. For the study, 22 men and women from Division I golf programs in the American Midwest practiced putting in silence and while listening to different genres of music, including classical, country, jazz, and hip-hop/rap. Results showed that participants performed better when they were listening to music — except when they were listening to rock. (Imagine Dragons can be classified as an alternative rock band. Oops.) Jazz resulted in the best performance. Meanwhile, a 2017 study published in the journal Frontiers in Psychology found that listening to music increased risk-taking behaviour in athletic performance, especially in men. When participants practiced shooting basketballs while listening to a motivational playlist, they were more inclined to shoot from farther distances, for example, which led to higher point rewards. But their shooting ability didn't improve. It's hard to say how research on music and athletic performance applies to those of us with office jobs, where "performance" is more about doing research or churning out reports. In 2016, I spoke with Daniel Levitin, a cognitive neuroscientist and the author of "This Is Your Brain on Music" (he's also a musician), who said that listening to music while working on something complex generally hurts performance. Instead, Levitin recommended listening to music for 10 to 15 minutes right before getting to work, so you're more relaxed and in a better mood. Bottom line: We're not in a position to criticise Reed's choice of pump-up ritual — he seems to know what he's doing. But if you're a golfer, we wouldn't necessarily advise choosing alternative rock. And if you've got a more sedentary job? Go ahead and blast that "Radioactive" — just make sure you shut it off before it's time to get cracking.